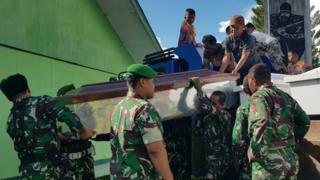 At least 24 construction workers have been killed by gunmen in Indonesia's eastern province of Papua, officials said. A soldier was also shot dead when a team of police and security forces were sent to investigate Sunday's killings, authorities added. The workers had been building a road and bridges in the remote and mountainous Nduga region. Police have blamed the deaths on separatist fighters. Insurgents calling for independence have been active in Papua for decades. The BBC's Rebecca Henschke in Jakarta says that if the killings are confirmed it will be the deadliest bout of violence in years in the restive province. Military spokesman Colonel Muhammad Aidi said the incident started when members of an "armed criminal separatist group" held a ceremony to commemorate what they considered to be their independence day on 1 December. Col Aidi said one of the workers from the construction company PT Istaka Karya was reported to have taken a photograph of the group, which angered them and triggered the attack. The bodies of the workers were found near a bridge they were building, he said. Police and troops who arrived in the area on Monday to investigate came under gunfire, leaving one soldier dead and another wounded, officials said. Papua declared independence from the Netherlands in 1961 but was incorporated into Indonesia eight years later, becoming its easternmost province. There has been a low-level separatist insurgency for decades but the Free Papua Movement is described as a fragmented and poorly armed rebel group. The Indonesian government heavily restricts access to the region by foreign journalists, citing security concerns, so independent information is scarce. Construction work in the dense jungle is part of President Joko Widodo's infrastructure push, an attempt he says to bring development and prosperity to the resource-rich area. However, Papuan leader Timotius Murib recently told the BBC: "We don't need development, because with development we lose control of our land." Work on the road has been postponed until the area is secure, Indonesian Public Works Minister Basuki Hadimuljono told reporters. Papua is home to one of the world's largest gold and copper mines, operated by US firm Freeport-McMoran, but it remains the poorest province in Indonesia. Papua shares the island of New Guinea with the independent country Papua New Guinea.